A companion volume to Dealing with Python: Spirit of Constriction. The most significant of the threshold points of life is the doorway into God's unique calling for us. He invites us through covenant to fulfil the destiny and purpose for which we were born. However, many of us fall at the threshold, rather than pass over it. We experience unremitting constriction, wasting, retaliation and forgetting--to such a degree that it's easy to doubt the promises of God. This pioneering work examines the spiritual implications of forgetting in relation to thresholds and covenants. 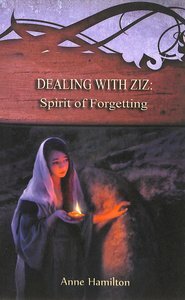 Because the opposite of remembering is dismembering--dismembering of truth--the spirit of forgetting is able to bar the way into our calling. About "Dealing With Ziz - Spirit of Forgetting (#02 in Strategies For The Threshold Series)"
Anne Hamilton has worked as a mathematics teacher and studied the integration of words and numbers (numerical literary style) in ancient texts. Some of her work is one of only a few modern books using this arithmetic metaphor as a feature to the writing. She is the author of fantasy, children's and theological works. Anne now works as an editor for a national radio network. She writes fiction and non-fiction. She is the president of Omega Writers Inc, an Australasian body of faith-inspired writers.